Nyla Usha malayalam actress profile and biography is given here. Being a Radio Jockey by profession, Nyla makes her silver screen debut with Kunjananthante Kada opposite to Mammootty. Much popular in Middle East as an Anchor and Host, Nyla is married to Rona Rajan & has a son, Arnaav. 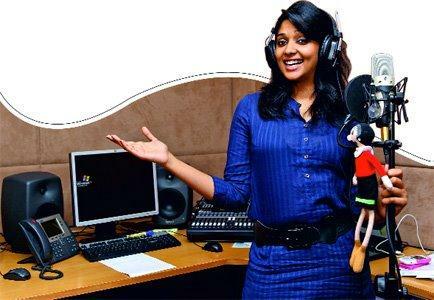 Nyla Usha is a popular Radio Jockey (RJ) who is much popular for her active presence as host for The Big Breakfast Club aired in 96.7 FM. Born to Sri Gopakumar & Smt. Usha Kumari, Nyla had done her school education at Holy Angels Convent and All Saints Thiruvanathapuram. Even during her school days, Nyla had been a fore runner excelling in various programs and extracurricular activities. Brought up, getting the care of her sister Athira and brother Kannan, Nyla was fascinated towards the world of modeling and did participated in various festivals conducted in colleges. Nyla did dream of becoming an air hostess which she loved to become a part from the early age onwards. But her dreams didn't have any follow up which eventually landed in the midst of hosting various programs and also lending her face and voice for functions held in the Middle East and Kerala. She got a number of chances to interview celebrities representing the movie industry. The Big Breakfast Club, a show aired in Hit 97.7 FM anchored by Nyla is a popular program which has become popular among the malayali community living in UAE. It was a rare occasion for Nyla to interview iconic South Indian actor Mohanlal for the Radio Channel. Married to Rona Rajan, the couple lives a blessed life with the presence of Arnaav, their cute little child. It was a remarkable moment for Nyla while conforming her entry into the world of entertainment pairing to Super star Mammootty in 'Kunjananthante Kada', a malayalam movie directed by Salim Ahamed who is known for his directorial debut 'Aadaminte Makan Abu'. Removing all rumors, it was Nyla Usha who was too lucky to get casted in a prominent role as the wife of Kunjananthan, the character played by Mammootty. It would be a perfect platform for Nyla to make her debut for a movie which does have scope for active performance. Working with national award winners, Nyla find comfortable with the situation. Meanwhile the actress who wishes to continue her job as RJ would like to reach more heights in acting career giving equal importance to anchoring in Radio.